"Best wings ever. they bake 'em. not only are they unique and tasty they are probably good for you. who knows who cares every now and then you just have to indulge. also, the service is friendly and fast. my favorite is the jamaican." "Their wings are off the chain. I mea so so so so good. I am African American and they treated me so nice and polite. I came there late and called ahead they were very polite." "The grilled wings here are excellent and the best in town. I also recommend getting a side of fries because it goes together good. Usually I go with the original hot sauce on my wings which is very tasty." "I love the spicy ranch wings extra well done!! Buffalo bills roadhouse has the best wings I've ever had. I never get anything else on the menu except for the fries, because the wings are so damn good. I come on average once a week and service is great!!." "This place is unreal, i can't even expess how killer their wings are words just don't do it justice. Just go and try it out for yourself, you'll want to keep coming back for more. Buffalo Bills needs to be on Food Networks Diners, Drive-ins & Dives with Guy Fieri or the Best Thing I've ever Ate, no joke. My choice is Origional Hot, it's the perfect combination of Spice and Flavor. Trust me check it out, you'll be amazed." "I travel every week all over the globe and have yet to find a better wing than this place serves! Order them extra crispy and you won't be disappointed. I would say there most popular sauce is spicy ranch with original hot being up there. I always ask them to burn my wings!! It leaves a char that you cannot get anywhere else. 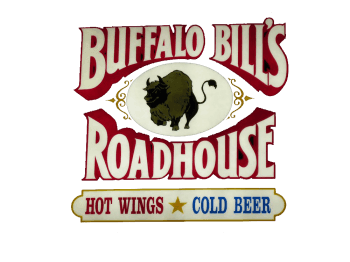 the one and only buffalo bills roadhouse!." "Okay, it's in a converted gas station and really doesn't have the greatest ambiance, but it absolutely has the second best wings in Westmoreland county. I visited because of yelp reviews and was not disappointed. I had the original hot wings which were great. Their sauce is unique; it's not just watered down Tabasco. When you are in New Ken you have to stop in." "Best wings ever. baked in a pizza oven and not deep fried. nice char. great sauces. atmosphere is a little dingy, and the menu has little to nothing to offer outside of wings. but, well worth it if you're in the area and want a quick bite to eat." "Buffalo Bill's has become our go to place for wings. Tried many of the varieties and all are delicious. I guess the grilling is the key. Decided to switch things up and grab an Italian Hoagie. I liked it. Not the best I've had, but better than many others. Although I can't say what would make it better, good ratio on meat to bun and toppings. Oh yeah, the fresh cut fries are really good as well. I usually dump the wings on top of the fries or give them the vinegar treatment." "Awesome Wings!!! This place was introduced to me by a college friend who said we had to check out this place. I am deeply grateful for the experience. Let me tell you a little about the place so you can anticipate the atmosphere and the deliciousness. I would qualify this place as a dive-bar/roadhouse. The inside is one large room with a vast beer cooler (six-packs, bottles etc) and several tables(seating for maybe 30?). There is a small bar area that faces the kitchen. The wings are cooked through the pizza oven (not deep fried) which is absolute heaven when it comes to digestion later in the evening! Dress is casual, come in, grab a seat and order some wings. I have had the 'primanti-style' sandwich and it is very good but HUGE!! This place easily rivals those commercial wing joints (BW3's) and in my opinion surpasses them in quality."